We reached Jaipur at about midnight and after getting into the hotel, we called it a day. The real Jaipur experience was to begin the next morning. This was not my first time in Jaipur – as I was in the Pink City for a couple of days back in 2006. This time, we had planned for a two and a half day trip before we headed back to New Delhi. Jaipur and its surrounding areas were ruled by the Kachwaha Rajput rulers – who had conquered the kingdom of Amer from the Meena rulers in early 11th century CE. The capital of the Amer/Jaipur kingdom was shifted from Amer to a newly built city of Jaipur – named after its designer and then Kachwaha ruler, Maharaja Jai Singh II – in 1727. Designed according to the Indian Vastru, the king was ably supported by his Bengali accountant, Vidyadhar Bhattacharya, who was later named the chief architect of the kingdom. The walled city is the first planned city of India and had multiple gates to enter and exit the city. The Pink City, as it is famously called was not always ‘pink’ (nor is it now, as I found it more ‘orangish’). When Prince of Wales, Edward Albert, the British Crown-Prince (later King Edward VII), visited Jaipur in 1876 during his trip to India, the old walled part was painted pink in color to welcome him as pink signifies good health and fortune. The colors remain the same today and hence, the city is famously called the Pink City. Day 1 began with a trip inside the walled Pink City. 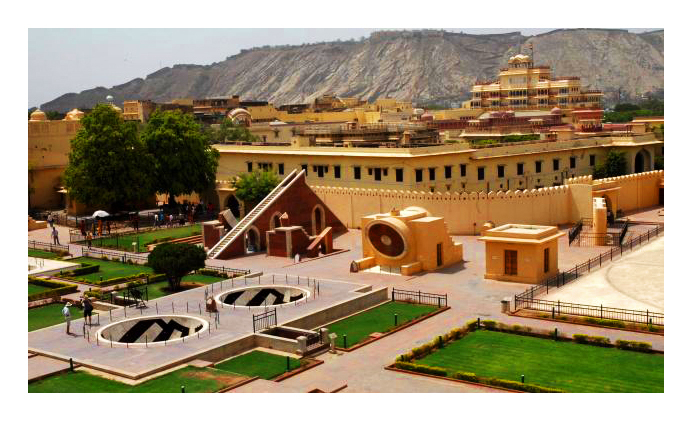 We started off with the Jantar Mantar – the complex consisting of various astronomical structures. Built by the astronomy enthusiast and mathematician king Jai Singh II, these devices are still used for calculating celestial body positions and altitudes, measuring time (with accuracy of seconds) and predicting eclipses, etc. Practical Tip: It wouldn’t be wise to visit Jantar Mantar on a Summer day, given all the structures are built of marble and other stone. A short walk from the Jantar Mantar is the City Palace, the abode of the royal family. City Palace is organised into various sections are accessible to the public. Chandra Mahal is the part where the royal descendants live and is inaccessible. Among the accessible parts, the Mubarak Mahal houses a large collection of textile and ornaments worn by the royalties. Close to it is the portion dedicated to the display of arms and ammunition. The Diwan-e-Aam and Diwaan-e-Khas are the royal courts where the rulers met with the general public, and special dignitaries and ministers respectively. Finally, the Buggi Khana displays a large collections of horse-drawn carriages – that were used for transportation prior to automobiles. In the courtyard of Pritam Chowk, one can see the nicely painted doorways, decorated with beautiful miniature paintings. After a detailed tour of the City Palace, we strode off to see the Hawa Mahal – the Palace of Winds. Hawa Mahal, with its numerous small balconies and windows, is located in the busy market place and was built in order to allow royal ladies to have a look into the daily life outside the palace. From a look at this, one can be sure that the royal ladies were not as much privileged as we often think, given that they were neither allowed to go outside their royal chambers, nor meet anyone other than the royal family. Nevertheless, it cannot be denied that the Hawa Mahal has an extremely beautiful facade – something that has made it the symbol of Jaipur. Finally, after checking out all the important structures within the wall and a quick lunch, we moved towards the Albert Hall museum – located just outside the walled part of the city. The stone for the construction of the building was laid by Albert Edward in 1876 and hence on completion in 1887, was named after him. Although initially, it was to serve the purpose of a Town Hall, it was converted to a museum to display the rich cultural heritage of Rajasthan. Albert Hall displays a huge collection of paintings, tapestries, structures and statues of ivory, stone and metal, various other jewelry and other precious items. What was pretty interesting to see was that the museum housed various foreign collectibles – ranging from statues and sarcophagus from ancient Egypt to vases from ancient Greece and Rome along with numerous items from Turkey, Far East and Middle East. Check out the link to check the collection. Talking about Albert Hall, it is important to mention the another interesting aspect – the thousand of pigeons that nest in and around the building. It is a sight to see the birds gathering to eat grains offered by people. More fun is to see children (and my sister as well) chasing these birds away, only for them to come back for more! Day 1 was long. But Day 2 was supposed to be longer… We started off by driving from Jaipur to Amer, which is about half an hour’s drive from Jaipur. The city of Amer and the Amer Fort was the seat of the rulers of Jaipur kingdom till the capital was shifted to Jaipur. Earlier, Amer city was only overlooked a smaller fort (where a stronger Jaigarh Fort stands now) till the strong Amer Fort was built by Raja Man Singh (one of the Navaratnas or Nine Gems of Emperor Akbar) in 1592. Presently, Amer Fort is looked over by the Jaigarh Fort. Amer Fort, much like Mehrangarh Fort of Jodhpur, housed the royal family along with large number of soldiers for protection and defense of Amer. To get to the fort, we drove up the stony path. However, there is the possibility of riding up the steep path on elephant back, in the same royal style as the kings of yesteryear. Among the number of interesting points within the fort, the first one is the Temple of Sila Devi. Legends say that the black stone that represents the goddess and is worshiped in the temple was brought back by Man Singh when he defeated the King of Jessore in Bengal (now in Bangladesh). Following this, one comes to the courtyard with the Sheesh Mahal (Palace of Mirrors). The Mahal, in laid with white marble, is intricately decorated by pieces of glass and presents a grand look. From the same courtyard, one can see the Maota Lake and the Amer town in front of the Fort. Moving on, we came up to a courtyard, passing through a richly decorated and hand-painted Ganesh Pol (or Gate), containing the private living area of the king. The courtyard contained lavish bed rooms and other chambers for the royal couple with a well-maintained garden in the center. The rooms had fascinating facilities – using reflecting mirrors and old air-cooler like concepts, respectively – to warm and cool them during winter and summer months respectively. Also, one can understand the importance of rainfall harvesting given here by the kings from the architecture (given that these are some of the most arid regions of the country). Two further courtyards contained the Zenana Deori (Queen’s provate chambers) and the palace of Man Singh. However, due to ongoing restoration project, we could not enter these parts. Nevertheless, it is worth mentioning the amazing view of the surrounding environment that the Fort courtyards provided. One can see the far-stretching defensive walls around the city – that gave the impression of the Great Wall of China. Another worth mentioning location is the Jal Mahal – the Water Palace, that is located between Jaipur and Amer and is surrounded by water of Man Sagar Lake. The palace mainly served the purpose of being the recreational house for the kings, while the surrounding man-made lake provided water to the parched agricultural fields around the region. One can get a better view of the place from the top of the hill on which Jaigarh and Nahargarh Forts are located. And also, you may want till dusk to watch the palace light up. A quick drive from Jaigarh brought us to Nahargarh Fort. Nahargarh, also called as the Tiger Fort (from an earlier name of the fort – Sudarshangarh, which means ‘abode of tigers’) by the locals, built in 1734 for protection of Jaipur city. Unfortunately, we were too late to enter its premise. But nevertheless, one can always experience the beautiful sight of the city of Jaipur below from this fort. A point to note is the while driving from Jaigarh to Nahargarh, bird-lovers should watch out for stray peacocks that roam around the roads. It is some sight to see peacocks fearlessly walking about. Well, that was all about our Jaipur trip. We drove back by night. After a half day spent next day, checking out the Jaipuri crafts – including the famous Jaipuri Razai (blanket), metal works and marble works, we took out train to New Delhi. It was one pleasant week in the deserts of Rajasthan – a state that must be explored by Indians and foreigners alike, to understand a crucial part of the Indian traditional and culture. But before I sign off, here’s a shot of the mountains of sweets that we came across in the old parts of the Pink City. An amazing view, I must say! Wow – what a great summary! I’ve not had enough time to visit all the places you’ve been to, but the missing ones are now on my list! Thanks for sharing your journey!